Edinboro University partnered with STANLEY Security to exceed ADA compliance requirements and provide greater accessibility and independence to students with disabilities. 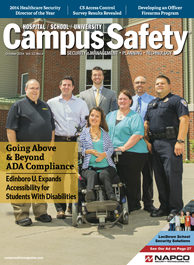 This article ran as the cover story for the October 2014 issue of Campus Safety Magazine. Click here to read the article published in Campus Safety Magazine.